Anne Reid interviews Derek Jacobi live on the West End stage for the first time ever! 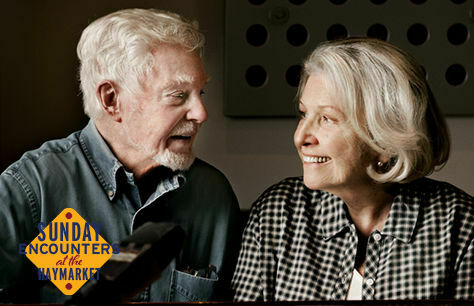 Tickets for Anne Reid interviews Derek Jacobi at the Haymarket! Two of Britain's most celebrated icons both on and off stage, Anne Reid and Sir Derek Jacobi, meet on stage for the first time in a live conversation that you won't want to miss! This pair of legendary actors together boast nearly a century-long, successful acting career combined. Reid and Jacobi are known for their countless appearances both in theatre and on television, and yet, they've only just met each other in person while on the set of Last Tango in Halifax, a romantic drama series by Sally Wainwright on BBC One. The two hit it off musically and recorded a duet album entitled You Are The Best Thing That Ever Happened To Me, which features some of the greatest tunes from The Great American Songbook. Anne Reid was born into a non-theatrical family in London's East End. She has won a total of 2 Olivier Awards for her performances in Twelfth Night and Cyrano de Bergerac, a Tony Award for Much Ado About Nothing, and a BAFTA Award for I, Claudius and the legend has also received two knighthoods – Danish and British. Also a notable founder of the Royal National Theatre, don't expect Reid to hold back as Jacobi's interviewer. You're in for a long night full of excitement and witty conversation! Anne Reid interviews Derek Jacobi is presented by Fane Productions as part of the ‘Sunday Encounters at the Theatre Royal Haymarket’ season. Anne Reid interviews Derek Jacobi tickets selling fast! Don't miss out on tickets to see Anne Reid and Derek Jacobi live on stage! Wonderful evening spent with such a talented duo.